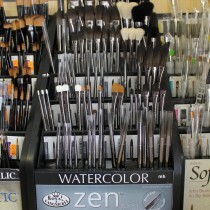 Here at the Local Art Shop we stock a wide range of brushes for acrylic, watercolour and oil painting. With some of the best art paint brushes in sets or singles designed for students or professionals at the best prices online in the UK. Our artists paint brushes come in many different shapes and sizes and brands.